In this historic hour, God is raising up a company of believers to serve as a divine intersection point between Heaven and Earth. All of the Spirit's previous outpourings and anointings are being united and activated at the same time-in our time! Bestselling author Tim Sheets presents a powerful, prophetic message. This powerful message will position you for victorious, Kingdom-advancing warfare, and prepares you to walk in the glory that is your inheritance. Get ready. This timely word will position you for victorious, Kingdom-advancing warfare, and prepared you to walk in the glory that is your inheritance. We are stepping into an hour where every past move of God's Spirit is converging, finding fullness and fulfillment. Learn how to come into alignment with this epic moment and witness Kingdom victory, advancement, and outpouring like never before! 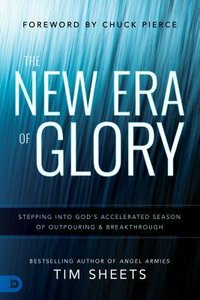 About "The New Era of Glory: Stepping Into God's Accelerated Season of Outpouring and Breakthrough"